BULAWAYO, Zimbabwe, Jun 15 2016 (IPS) - “It is everything” is how smallholder farmer Nyovane Ndlovu describes beekeeping, which has long been an alternative sweet source of income for drought-beaten farmers in Zimbabwe. A drought worsened by the El Nino phenomenon – which has now eased – led to a write-off of crops in many parts of Zimbabwe and across the Southern Africa region where more than 28 million people will need food aid this year. More than four million people need assistance in Zimbabwe, which has made an international appeal for 1.6 billion dollars to cover grain and other food needs. The drought, the worst in 30 years, has destroyed crops and livestock. Ndlovu, 57, from a village in the Lupane District, a dry area prone to drought and hunger, is one of the country’s growing number of honey heroes, using forest resources to cope with a changing climate and complement his farming income. But even beekeeping has not been immune to the latest severe drought , and many farmers who have depended on honey to make ends meet are reporting major losses this year. “Honey is my food and my children love it because they know each time I harvest they never go hungry,” says Ndlovu, who trained in beekeeping more than 10 years ago. Beekeeping, practiced by more than 16,000 farmers in Zimbabwe, generally complements maize and grain crops. Last season, Ndlovu harvested a tonne of maize and 0.5 tonnes of sorghum, low numbers even for a drought year. Lupane District located 172km North West of Zimbabwe’s second city of Bulawayo is home to more than 90,000 people, many who get by through limited cropping and extensive cattle rearing. The area is also home to state-owned indigenous hardwood forests, on which communities depend for fuel and food. Ndlovu has more than 20 Kenya Top Bar hives and two Langstroth hives – considered the best technology for apiculture because they give a higher production and quality honey. In a good season Ndlovu earns more than 500 dollars from honey sales. He even has his own label, Maguswini Honey, which he plans to commercialize once his honey has received a standard mark. A 375ml bottle of honey sells for four dollars in the village but five dollars when he delivers it to customers in Bulawayo and beyond. 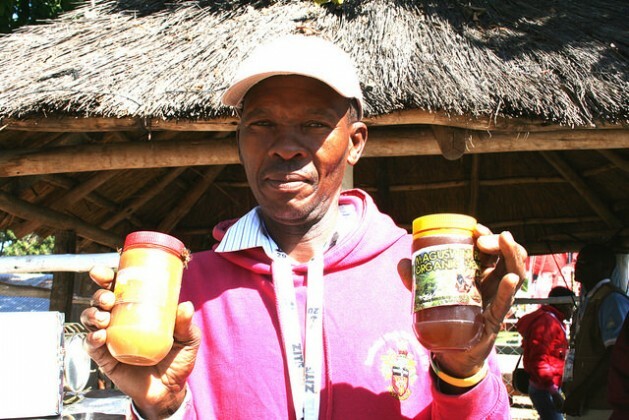 Last year, Ndlovu and his neighbours, who belong to Bumbanani, a 30-member local beekeepers association, sold 900 dollars worth of honey within three days of exhibiting at the Zimbabwe International Trade Fair, an annual business showcase hosted in the city of Bulawayo. This year, they did not even make half the amount because they harvested less honey because of the drought. “Last year I got three 25-litre buckets of honey and this year not even one bucket. The weather changed so that the bees lacked enough flowers for food and the water was also scarce and the hives did not have a lot of honey,” Ndlovu told IPS. Another farmer, Nqobani Sibanda from Gomoza village in Ward 12 in Lupane, this year harvested one 20-litre bucket of honey compared to 60 litres last year. “This year the flowers withered early and we think the bees did not have enough food, hence the honey harvest was low. I have four hives and each hive can give me up to 20 litres of honey on a good season and I can get 300 dollars or more, but not this year,” Sibanda said. Development researcher with the Institute of Development Studies at the National University of Science and Technology (NUST), Everson Ndlovu, told IPS that income-generating projects such as beekeeping are an easy way for farmers to earn extra income in times of poor or no harvests and these projects can be up scaled into viable commercial enterprises. Honey is traded globally and last year’s sales of natural honey were worth 2.3 billion dollars, according the World Top Exports website that tracks key exports. The sales were led by Europe with 35.2 percent of international honey sales, with Africa accounting for just 0.4 percent of the exports. Bees which provide honey, propolis, Queen Jelly and beeswax among other products, help boost food security for some two billion smallholder farmers worldwide at no cost, a February 2016 study by the United Nations Food and Agriculture Organization (FAO) found. The FAO has called for the protection of bees and insects that play a vital role of pollination thereby sustainably increasing food supply. However, climate change is affecting global bee colonies. “Farmers have been affected by the drought and beekeeping was not spared, as seen by the low amount of honey they realized this year compared to last year in Lupane, a dry area,” said Clifford Maunze, a beekeeping trainer and Project Officer with Environment Africa under the Forestry Forces Programme supported by the FAO. “We have trained farmers on beekeeping and helped them counteract the effects of the drought by planting more trees that bees like such as Moringa Oleifera, commonly known as the drumstick tree, which flowers constantly and have promoted the development of homestead orchard where they can have citrus trees to provide forage for the bees,” Maunze said. Environment Africa, working with the Department of Agriculture Extension Services (Agritex), has trained 1,382 farmers in Lupane District and over 800 in Hwange District on beekeeping under a programme started in 2011. Lupane was chosen for apiculture projects because of its indigenous forests, some of which are threatened by expanding agricultural land, veld fires and deforestation. “While the drought has affected farmers in Lupane, apiculture is the way to go providing income and jobs because it is cost-effective,” Maunze said. In drier regions like Matabeleland North Province, farmers can harvest honey twice a season and with at least five hives a farmer can get 100 litres of honey. This can be even more in regions with higher rainfall and forage, where farmers can harvest up to four times a season. Figures from the national statistical agency Zimstats and Agritex show that Zimbabwe produces over 427,000 kg of honey annually against a local demand of 447,000 kg. The deficit of nearly 20,000 metric tonnes is made up through imports, a situation that farmers like Ndlovu are seeking to change through intensive investment in apiculture. Zimbabwe is aiming to raise honey production to a target 500,000 litres by 2018, according to Zim-Asset, a national strategy to revive the country’s battered economy, currently facing a cash crisis. Very good article and a strong indication of how severely climate change is going to affect everyone. And kudos for noting that the problem is a result of climate change – all too many sources, especially in the USA (where the government puts a strong lid on the issue, not allowing scientists to make public statements without prior approval (!) and heavily editing consensus reports to edit out as much as possible). THANK YOU! We need many more articles like this to wake people up before it’s too late. a kg is not the same as a metric tonne.